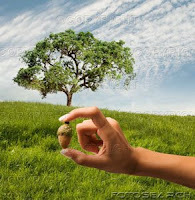 "Once upon a time, there was an acorn sitting in a oak tree. Every day, the acorns played and told each other stories about how, once they fell, they'd start turning into beautiful oak trees themselves. But, this acorn wouldn't believe. The other acorns tried encouraging him to fall. But, he didn't want to risk it. Being an acorn was fun. And he couldn't be sure the stories were true. So, he stayed in the tree, enjoyed being an acorn, and was eventually eaten by a squirrel." Wow, I interpreted that three different ways in about 30 seconds. You must be a songwriter.